José Melchor Gomis y Colomer (6 January 1791 – 4 August 1836) was a Spanish Romantic composer. He was born in 1791 in Ontinyent, Vall d'Albaida, Valencia Province. He was director of music for an artillery regiment during the Napoleonic Wars. An early melodrame by Gomis for voice and orchestra was performed at Valencia in 1817. He wrote the music of the Himno de Riego, named after the rebellious General Riego (1784-1823) and since used as the national anthem by various republican governments of Spain. Gomis's political views caused him to live in exile after the accession of Ferdinand VII in 1823, in Paris and in London. In both cities he was a friend of his fellow exile the composer Santiago Masarnau, whom he may have introduced to London musical life. 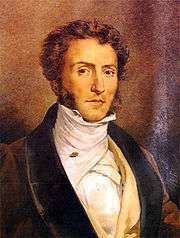 In Paris, Gomis wrote a successful singing method, published in 1826 with dedications to Gioacchino Rossini and François-Adrien Boieldieu, and in London his choral work L'inverno was performed in 1827. In 1830 his opera Aben-Humeya was performed in Paris. Gomis's Paris operas Diable à Seville (1831) (staged with the support of Rossini) and Le revenant (1836) gained respectful reviews from Hector Berlioz. Le portefaix, the most successful of his operas, had a libretto by Eugène Scribe, (originally offered to the composer Giacomo Meyerbeer). Gomis was made a Chevalier of the Légion d'honneur by King Louis-Philippe. He died in Paris in 1836 of tuberculosis, leaving a number of works unfinished, including the opera Le comte Julien, also to a libretto by Scribe (and eventually set in 1851 by Sigismond Thalberg as Florinda). ↑ "José Melchor Gomis, un compositor romántico olvidado". El País. 12 August 1978. Retrieved 23 August 2015. ↑ "El Himno de Riego, la música de la República". El Mundo. 28 November 2003. Retrieved 23 August 2015. Dowling, John (n.d.). "Gomis (y Colomer), José Melchor [Melchior]", in Grove Music Online (subscription required), accessed 23 August 2015. Johnson, Janet (1993). "Rossini in Bologna and Paris during the Early 1830s: New Letters", in Revue de Musicologie, vol. 79 no. 1, pp. 67–83.